Over six hours of video tutorials. Drawing Essential pack 4: Creative Sketch. You will get over 2 hours and 40 minutes of video tutorials, included 8 Chapters. You will learn to draw and refine portraits, figure, creature, hair, and texture. You will learn contour lines and shading technique to create volume in drawing. You will learn to convey soft and hard surface textures in your sketch. You will learn to make your sketch page more than presentable that will impress your potential employers. You will learn pencil techniques with variety of tips and tricks. If you are new, my tutorial will make a HUGE improvement in your digital art. If you are good, this tutorial is guaranteed to boost you to the NEXT LEVEL! You will get HD wmv Video Media files (approx: 1280 x 720). Drawing Essential pack 5: Drawing dynamic poses. You will get over 2 hours of Video tutorials, included 8 Chapters, 8 figures. You will learn to draw and sketch Foreshortening Dynamic Action Figures. You will learn to create action pose that is more dynamic using perspective foreshortening. You will learn to use geometry shapes and gesture lines to advance your drawing. 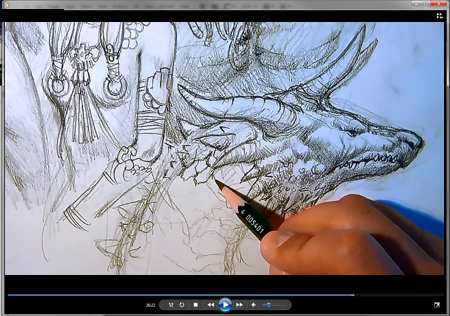 You will learn traditional drawing tips and tricks to create foreshortening figures. Drawing Essential pack 6: Shading Technique. You will get over an hour and twenty-eight minutes of video tutorials, included 4 chapters. You will learn how to quickly identify direction of light and shadow. You will learn different way to use pencil as shading tool. You will learn how to add shadow within shadow. You will learn how light interact with figures and how body often cast shadow on itself..
02) Rendering portrait and figure. 04) Draw, render and texture Dragon. 05) Creature and merging two element. 06) Deep Sea Princess Creature. 07) Rendering hard and soft surface for texture. 08) Finishing up the sketch page. 01) Draw poses 01 side kick. 02) Draw poses 02 foreshortening. 03) Draw poses 03 fly in angle. 04) Draw poses 04 leaping foreward. 05) Draw poses 05 front kick. 06) Draw poses 06 upside down. 07) Draw poses 07 top down. 08) Draw poses 08 slide and shoot. 01) Intro to shading and value. 02) Basic shading on figures. 03) Extreme shadow cast on figures. 04) Complex shading on figures. In this tutorial, you will learn the Quick and Easy way to draw and shade your art work in the most creative way that will make your sketchbook look very professional. You will learn to apply simple shade and manipulate line work to create form and produce soft and hard surface looking textures. You will also learn the Correct Approach to Drawing and Shading foundation from rough sketch to finish drawing. If you are struggling with drawing action pose and dynamic figure in perspective, this tutorial is for YOU! One of the another frequently requested from viewers (YOU) is Premium Traditional Dynamic Foreshortening Figures Tutorial. 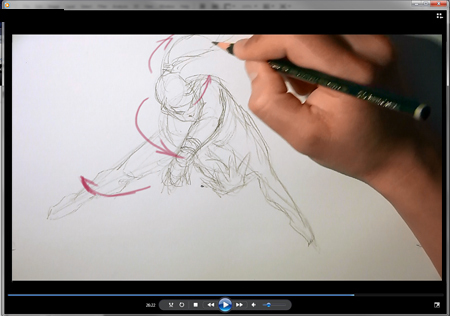 In this tutorial, you will learn the Quick and Easy way to draw figure in various camera angles with dynamic foreshortening and action packed poses. You will learn to apply simple metric and theory of how to easily to create a pose you want in your shots. You will learn to begin with geometry shapes and gesture lines drawn. You will also learn the Correct Approach to Figure Drawing foundation from rough sketch to finish drawing. 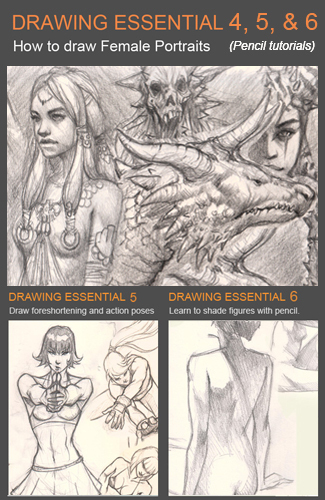 Drawing Essential 6 -LEVEL: Beginners - Intermediates. Shading seems complex, but it is really simple once you know the principle. You will learn how to shade figure using just two tones that is often use in comics drawing. You will learn complex shading using shadow within shadow to make the figure feels real. You will also learn to identify the direction of shadow and be able to put it in the correct direction. If you are a beginner, we recommend to watch the video tutorial multiple times to get the most out of them. ©2007-2011 CreativMobi LLC & Xia Taptara, DDMI All Rights Reserved. "TheArtClasses.comTM" and "idrawgirls.com" are trademarks used by CreativMobi LLC & Xia Taptara.